As Australians, pets are an important part of our lives. It’s estimated that over 80% of Australians will have a companion animal at some period in their life. Pets play an important role in a child’s life, not only for the enjoyment they bring but also for the important life lessons that they teach. The joys of pet ownership do however have their risks. 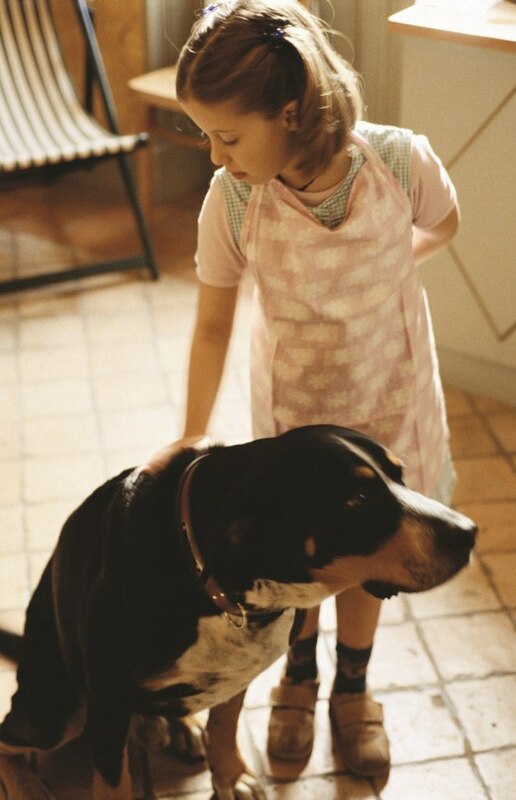 Children under the age of five are at the most risk of a dog bite with incidents often triggered by the child’s interactions with the dog. This advice you will find here is general and if you have any specific concerns relating to your dogs and children then you would be best to contact a dog behaviour specialist. One of the easiest things that you can do to minimise risk is to always supervise your dogs and kids when they are together. Ideally, supervision would be one adult for the dog and one adult for the child, that way you can form the ground rules and teach both the child and the dog appropriate and safe behaviour. Many dog bites occur during unintentional rough play and children are often not aware that their behaviour may be annoying or threatening to the dog. High pitched squeals or uncoordinated attempts at showing affection to the dog may cause concern, which can trigger a dog to act defensively. If your dog happens to take one of their toys, teach your child to call you to retrieve it rather than trying to get it off the dog themselves. We’ve all heard the term ‘let sleeping dogs lie’, it’s important to teach your children to never approach dogs whilst they are having a rest. They may startle the dog awake, triggering a defensive reaction. If you need to wake the dog up, call them from a distance so they are able to become orientated after waking. Some dogs may become defensive when around their food, this is known as guarding. Teach your children never to approach a dog that is eating or has a treat like a bone. If your child accidently drops food around the dog, make sure they know to call you rather than try and retrieve it themselves. It’s important to teach your child to never approach a dog without adult supervision. Even if the dog is familiar to the child they should always ask a parent or carer for permission, if they want to pat the dog. First you should check with the dog’s owner that they are ok to have a pat and that the dog is friendly towards children. You may want to approach the dog first as an example so your child can learn from you. Approach the dog on an angle at a slow, calm pace and always be gentle. Use the dogs name in a soft, calm and friendly voice. Curl your fingers into a fist and slowly extend the back of your hand to the dog, allowing them to sniff. After they’ve had a bit of a sniff and they are ok with it, gently pat the dog under the chin or the side of the chest. Try to avoid patting the dog on the head or the shoulders as this may be threatening to them. If the dog is still calm after this experience then guide your child’s hand to repeat the actions that you have just done, giving the dog a bit of a pat on the chest or under the chin. Remember to give praise to both the dog and child for calm and correct behaviour. Also remember to practice this skill over a period of time until you are confident that your child will correctly pat the dog, but always supervise their interactions closely. When approached by an unfamiliar dog, your child’s first reaction may be to run and squeal with excitement, but this can often confuse or frighten the dog. Teach your child that if an unfamiliar dog approaches them they should stand like a statue with their arms by their side and try not to make a sound. Most likely the dog will just sniff and walk away, but if they are knocked over then they should curl into a ball until the dog goes away. It’s also important to note that dogs can feel threatened by eye contact or staring so teach your child to look at his or her feet until a relationship has been established with the dog. Remember that these steps can help your child develop strong, lasting relationships with our canine friends.